Honda X-Blade facelift is expected to launch soon in India with few cosmetic changes. The updated bike will come with new graphics and color options. 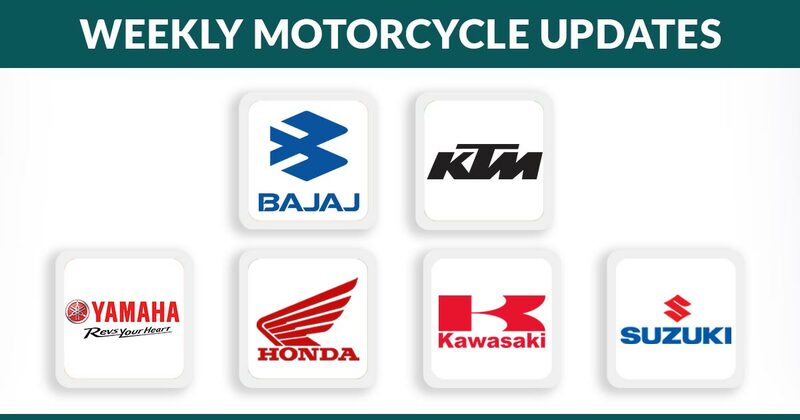 However, no big mechanical changes are expected as the updated bike will come with the same 162cc, single cylinder motor that generates power of 14 bhp and 13.9 Nm of torque. The refreshed bike would be priced around INR 88.094 (ex-showroom). In the next few days, Piaggio will launch the Aprilia Storm 125 in India with a price tag of INR 65,000 (ex-showroom). Bookings will begin soon for this scooter for the buyers whereas deliveries are commenced in the first week of May. On the mechanical front, Aprilia Storm 125 shares its engine with Aprilia SR125 scand comes in three different color options. As per the news, two new color shades will be added to the portfolio of 2019 Bajaj Dominar 400. The bike, currently, comes in two different color options-aurora green and vine black. Recently, a TV commercial has also showcased the red and silver trim of Bajaj Dominar 400. The company will launch these new trim in upcoming days with an increase in public demand. The bike price starts at INR 1.73 lakh. The 2019 model of the naked street bike, the GSX-S750 has been launched by Suzuki recently. The updated bike now comes in two paint schemes with refreshed graphics. The two new paint schemes include metallic meta black and pearl glacier white. No major changes are seen in the new bike, apart from cosmetic ones, and it retails at INR 7.46 lakh (Delhi, ex-showroom). Hero Motocorp has recently bumped up the price of its 200cc motorcycle, Xtreme 200R. The bike has received an INR 1000 price hike, and now retails at INR 90,900 ex-showroom, Delhi). Hero Xtreme 200R bike is powered by a 199cc powermill that generate 18.1 bhp power along with 17.1 Nm torque. The bike also holds the tag of the most affordable 200cc bike in India. The recently launched adventures tourers-the TRK 502 and TRK 502X have received s price hike from the company. Benelli has put an additional INR 10,000 to the price tag of both the models, which now comes at INR 5.1 lakh and INR 5.5 lakh respectively. Both the bikes have been launched in February 2019 and in the first month itself got 150 plus bookings, which indicates a good response from the customers. The Gurgaon based e-motor vehicle manufacturer-Revolt Intellicorp was spied testing one of its upcoming e-bikes. Unlike the previous spotted camouflaged mule, this new e-bike was seemed to be undisguised. From the leaked pictures, the street bike stance of the bike along with red flaring got revealed. It is also rumoured that this will be the first AI powered e-bike in India and will launch in June 2019.